When to finish smoking a cigar? How much to leave? For a thick cigar, a good guide is probably when there is around 1 inch of cigar left, or maybe just a little less. 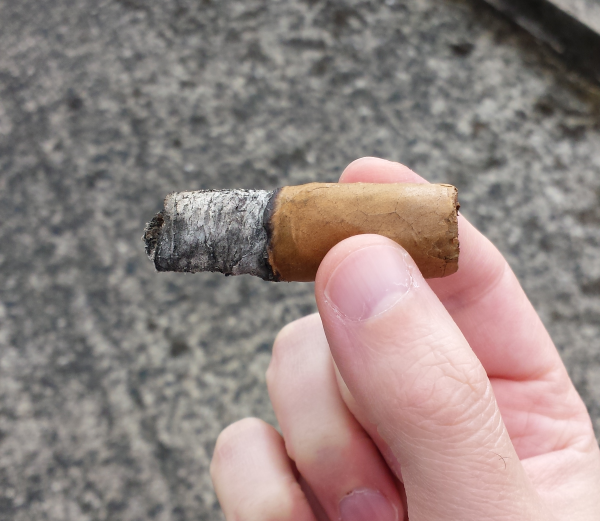 Around a thumb-width or so.By the time the cigar burns down to the last inch, you should feel it quite warm, or even hot, to hold. Especially so when you take a draw on the cigar. This is probably a good sign that you’ve had the best of the cigar and it’s unfortunately time to stop. Mini cigars and cigarillos you can smoke down even further to maybe half to three quarters of an inch. Don’t forget to put your cigar out safely after smoking it to avoid the risk of a fire.